Started by seven people in Saharanpur, Uttar Pradesh, who came together to try to help people, communities and the environment, Panchtatva is a platform for people to facilitate the creation of a better society. They realised that to do this they had to “work like crazy”, so they adopted the name Crazy Green with the idea of making the earth suitable for the next generation. At the start of the project they had to do everything temselves. So, they started planting trees in nearby parks. Gradually a few people came forward and joined with them. They started with only ten big plants in a park at Saharanpur but after only a few days, seven plants had been broken. This incident taught them that nothing is easy and it was going to be hard work. Then suddenly they met a person who helped them to plant 500 saplings on a hill at Chamba. At Rishikesh, they developed two parks with the help of locals. In the process of planting trees they realised that it’s not only planting that can serve the purpose of making a clean and green environment. In fact, lots of other things like the reuse of materials, saving resources, and lower consumption are needed. At this point we saw that every person needs to improve his life style and make small changes in the routine of his life. Persons who have time but no money; like students, retired persons, house wives and low income group people. Persons who neither have money nor time. The first segment can help by devoting time in different activities. 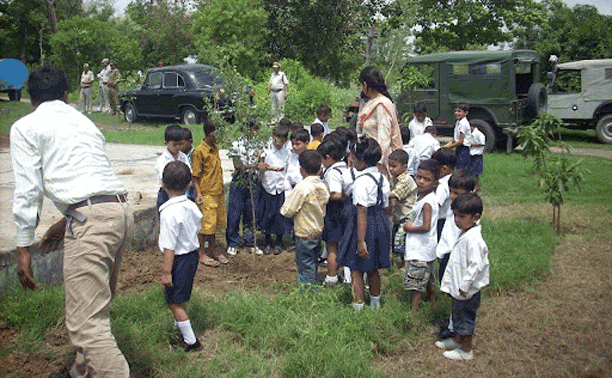 They can plant trees and can teach others about the necessity of the work which they are doing etc. The third segment can help to raise awareness in others and can change his/her lifestyle which needs minimum resources. While working on the Crazy Green project for the environment, the founders realised that by doing something for the welfare of others made them “feel contented somewhere deep in the heart”. Therefore, they extended their service scope in five main categories. Due to the five elements, they named the group Panchtatva. They now run many initiatives in the area around Saharanpur.